Many types of pitches for developing and established pitchers exist, along with grip variations on each of those possibilities. The age, physical strength, and throwing fundamentals of young pitchers must be a consideration before attempting to throw any pitch besides the primary pitch, the fastball. Additionally, the grip, arm angle, and release point one player employs may not work for each player, so players must experiment with those factors until they feel comfortable with the desired ball movement and pitch control. Most youth players below the high school level do not have the hand size or strength to throw some of the types of pitches, so they should be careful of trying some of these at a young age. Many arm injuries occur because they throw pitches they are not physically ready for throwing. As athletes grow, develop the correct throwing mechanics, and achieve greater physical strength, they can expand their pitching repertoire. For most young pitchers, they should stick to throwing four and two-seam fastballs, along with a simple changeup. Also, until the high school ages, they should stay away from the cutter pitch, the split-finger fastball, and the slider. As you will read about, those specialty pitches put extra stress on the arm. The baseball pitches like the forkball, knuckleball, and screwball should not be a consideration for pitchers unless they give them a try as a last-ditch effort to save their pitching career. Very few players in the history of the game could perfect those types of pitches to make them worthwhile. Deciding which age to throw the curveball should come after consultation with a professional pitching coach, as the age can vary from player to player. Player and hand size are crucial elements to throwing a curve correctly so that the choice will be different from player to player. Of course, the first concern for young ballplayers should be perfecting the throwing fundamentals. Without those, speed development, control, and injury avoidance will not occur. Seeking out a trained pitching coach to ensure good throwing mechanics is essential. It is worth noting that times have changed since many adult coaches played, so they should stay up to date on the latest pitching methods and drills to use with today’s young pitchers. Once the throwing mechanics are sound, players can begin to work on their pitching delivery, which is another variable for all pitchers. Developing balance, timing, and the best arm angle for the pitcher will take time, experimentation, and practice. Following is a list of the most common baseball pitches and mentioned in the order they should be learned. Kids should try them with their natural arm angles without trying to change their normal release angle so as to avoid injury. Four-seam fastball. This throwing grip is the one kids should learn first from the beginning. 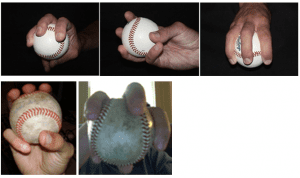 It is the ideal way to grip a ball when playing catch and from each position on the ball diamond. The four-seamer is the fastest baseball pitch and the one with the least amount of movement. 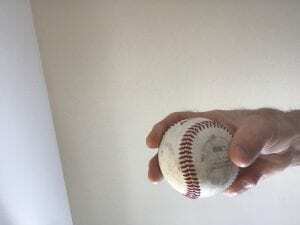 For young players whose hands are still quite small, they can practice this throw with a three-finger grip until their hands grow and when they can keep the two-fingers on top of the ball with the four-seam grip. The ability to keep the middle finger on top through the middle of the ball with no twist upon release is critical. The ideal grip to get the most speed and control is with the fingers and thumb centered on the ball. This grip provides the most spin upon release. With youth, it’s important to make sure their middle finger is on the seam of the ball as that is the last thing that will touch the ball on release and this adds spin to it. 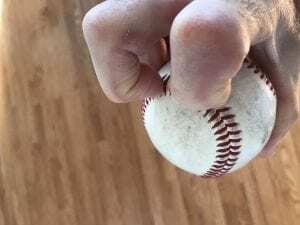 Two-seam fastball – The ideal for pitchers is to have a fastball that moves, and that is what a two-seam grip can produce. Of course, this may not happen for young pitchers, but that doesn’t mean they should not practice this pitch with the hope that someday the ball will sink for them as it approaches the hitting zone. This two-seamer can be gripped with the two seams or across the two seams. As they learn to control it, they can move their thumb position up the side of the ball to get more movement. 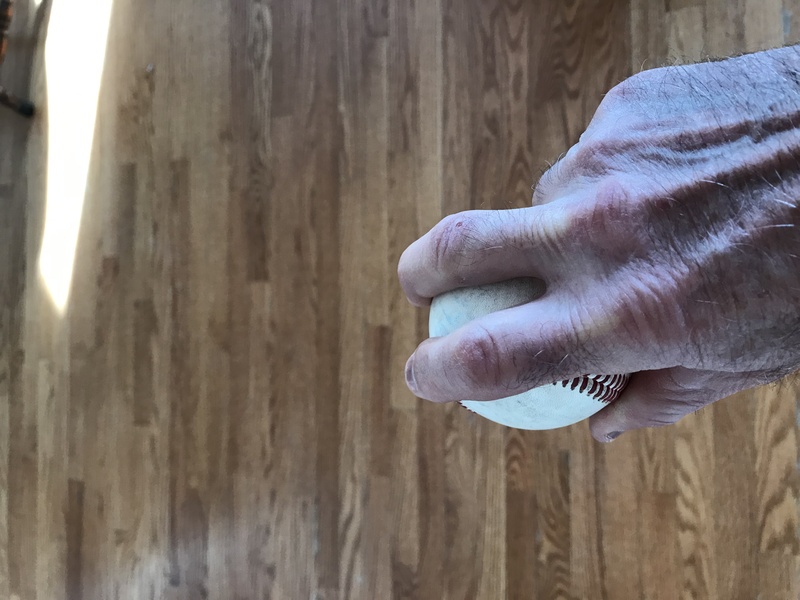 Young pitchers should experiment with the grip to find out which one they hafe the most feel for, either with the two seams or across the two. The changeup. The third pitch to learn is the changeup. The concept of this pitch is that it is thrown with the same arm speed and motion as the fastball. The changed grip on the ball takes the velocity off the ball compared to the fastball grip. At least, that is the intent, but it takes a long time to develop that sameness. The most common change-up grip is the circle change, which keeps the thumb and index finger on the side of the ball. That grip automatically takes speed off the ball allowing a pitcher to keep up their arm speed but with less velocity on the ball the result. 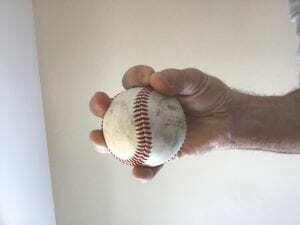 This off-speed ball is the first changeup grip to have kids try. Another change up for youngsters would be a three-finger grip with the ball set deep in hand, which also takes speed off the ball. Young players should experiment with both until they can control one and feel comfortable throwing it in a game. The development of an efficient changeup will allow a young pitcher to stay away from some of the other specialty pitches that may create arm injury or soreness in young players. This grip for kids can be with or across the seams depending on their comfort level. Even young pitchers should work on a changeup and realize it is not only important for changing speeds on the hitter, but also to set up their fastball afterward. The curveball. Much debate exists as to whether kids throwing curveballs is harmful to the arm. That debate may never be solved, but most would agree that if thrown the correct way, an increased chance of arm injury is not likely. The problem comes in with small hands that most kids possess because they cannot keep the fingers on top of the ball. When kids, parents or coaches insist on young players (under 14 years old) throwing the curveball they should be taught the correct way and limit the number they use in game situations. The ability to keep the fingers on top of the ball without a significant twist of the wrist should make the strain on the arm minimal. Most youth pitcher will want to twist their wrist upon release and when that occurs, coaches should back off its use until they can throw the curve with the fingers staying on top of the ball with minimal wrist action. Following are the specialty pitches that high school and above pitchers can give a try. The knuckle curve. 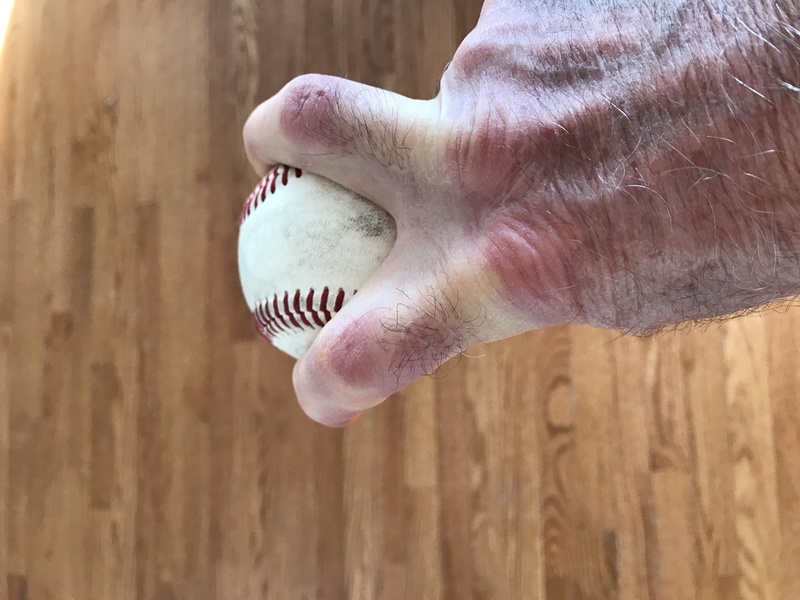 This pitch is thrown with a spiked grip with the index finger and with a curveball motion with the fingers upon release. When pitchers do not like the action of the regular curveball grip, they can give this a try, but with knowing it may be a hard pitch to perfect and control. It is very effective when thrown correctly because it tends to get a little more spin and speeds are slightly faster with this grip than a normal curve grip. This method helps kids understand the ball comes off the middle finger and the index finger is generally not very important to impart the correct spin on the ball. The slider and cutter are two types of pitches that youth should avoid. These two pitches are closely related. 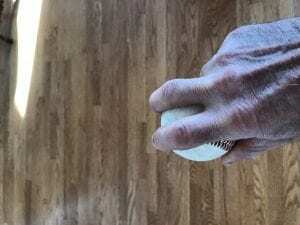 It takes strong hands and forearms to have the middle and index fingers cut through the side of the ball to get the late movement those pitches require. That late-moving action with the arm may tax the throwing elbow enough to create elbow injury, even for fully developed athletes. Youth pitchers are not ready for this pitch, but many have a natural cut to the ball when they throw so that may be useful for pitching but not for other position throws. The knuckleball. The good news about throwing this pitch is that great arm speed is not necessary and arm injury is less likely. The bad news is that it is almost impossible to control and get the dancing movement of the ball required to get hitters out. There have been very few pitchers in the history of major league baseball who threw the knuckleball as their primary pitch. Once again, this pitch grip is almost impossible to perfect, especially for small handed players. 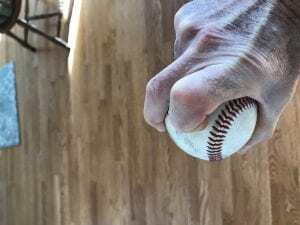 The Split-finger fastball is one of those types of pitches that became popular for a time, but have become less so in recent years. Today’s data seems to suggest that the split-finger fastball is an injury trap pitch because the grip puts too much pressure on the elbow. With that in mind, this pitch is the last resort one to try for fully developed players because of the risk injury. The plus side for those who do develop this pitch is that it is one of the most difficult to hit because the ball drops quickly at the last second when it gets into the hitting zone. That is why it is called a split-fingered fastball when it is another change-up. This is actually not that difficult of a pitch to throw because the ball tends to remain centered with this grip, but the increased stress placed on the arm to throw it makes it a dangerous one to learn. Forkball and screwball. These two pitches are outdated as they are tough on the arm because of their very nature. 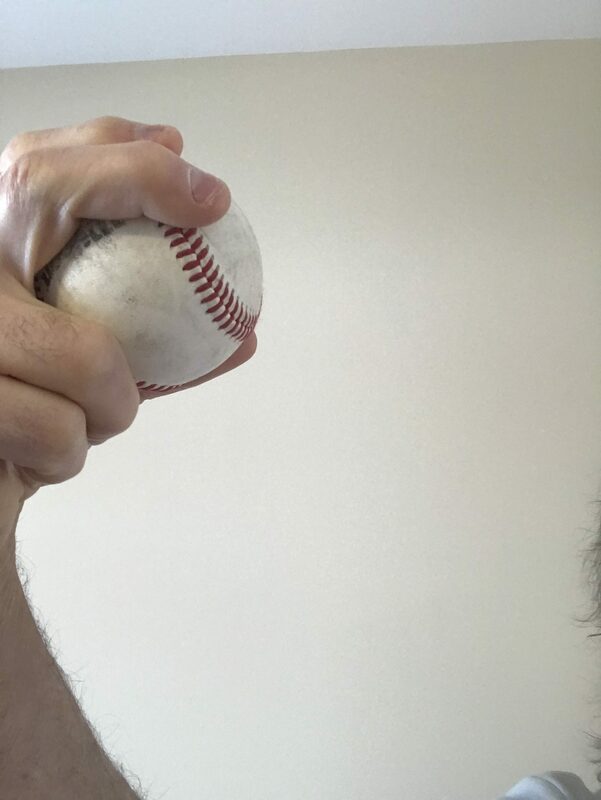 The forkball is like the split-finger but with the wider gap between the fingers, which puts even more stress is on the elbow. 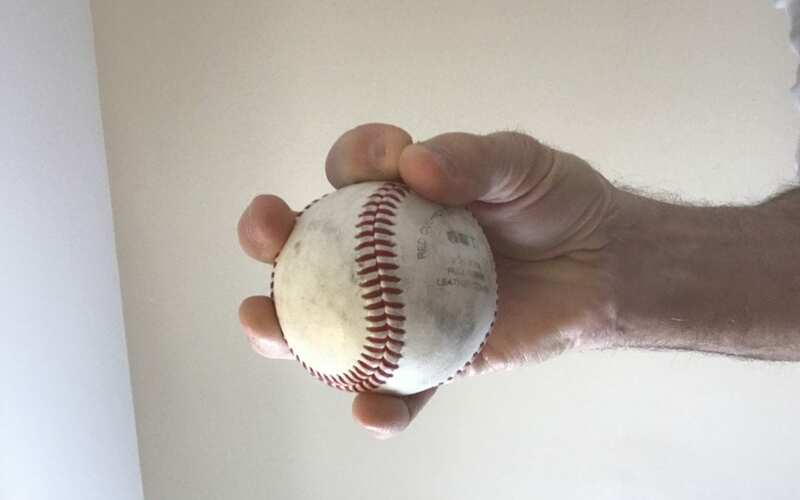 The screwball requires an outward movement of the forearm and wrist upon release, which can place more pressure on the shoulder joint, thus a considerable injury risk. O won’t even show these grips here or arm action so kids do not try them.